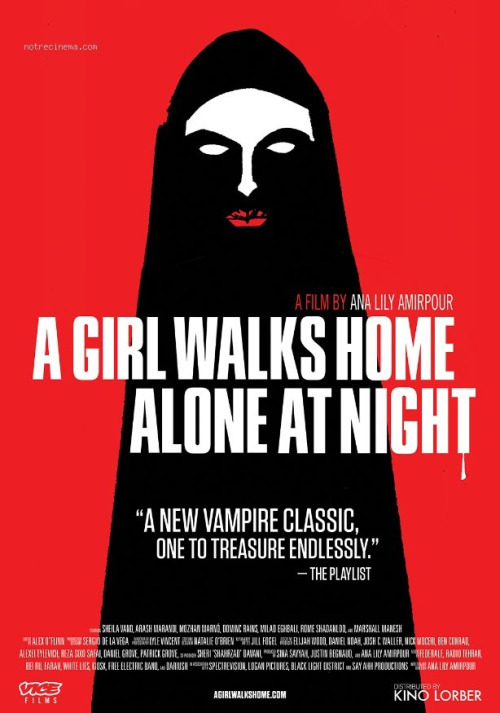 The best one-sentence description of A Girl Walks Home Alone at Night is: David Lynch meets vampires, in Iran. But to say A Girl Walks Home Alone at Night looks “Iranian” is not true at all. The desert landscapes and the city streets (mostly at night) could ‘place’ this story in southern California, or maybe Texas, in any time from the 50s and/or up into the 70s (and according to imdb.com, the film was shot in California). There’s more than a touch of American Graffiti here, with protagonist Arash (played by Arash Marandi) wearing blue jeans and a white t-shirt, looking like a cross between James Dean and early John Lennon. I hope I’m not spoiling anything for anybody by saying this is a vampire romance movie. Of sorts. The vampire in question, nameless in the movie, but in the credits called ‘The Girl’, is a teenager, anywhere from 15 to19 years old. She lives alone in a basement apartment, the walls of which are covered in western pop music icons like Madonna and Michael Jackson. When she goes out to roam the streets of what is called ‘Bad City’, she wears the traditional black hijab that all women in Iran have to wear in public, but rather than give her a modest, demure look, it looks amazingly vampiric, like a Dracula cloak. She seems to only drink the blood of ‘bad’ men, like a drug dealer/pimp. And she in fact questions a young boy, asking him repeatedly if he is ‘good’. Apparently satisfied that he’s telling the truth when he says yes, she leaves him alone, with a warning to “be good.” So in a sense she’s also a vigilante for the neighborhood, and in one great scene, with her riding a skateboard down an empty dark street, her hijab billowing out behind her like a cape, she looks very superhero-like. Except that at one point she does drink the blood of a man whose only crime, that we can see, is that he’s an alcoholic homeless dude. So how ‘good’ can our vampire be, ever? Even she acknowledges this by saying at the end of the movie, despite her observations and whatever she’s learned from her encounters with humans she doesn’t kill, “I’ve done bad things.” It’s a key line, and I hope the translation is true, because she’s saying she has been bad in the past, implying that she may think of herself as not bad now, in the present. And yet, she’s still a vampire, something romantic interest Arash is only barely starting to understand (though he himself is not exactly ‘good’ either, and maybe gets worse during the movie). How are the two of them going to be together? The answer seems to be that that is the wrong question. That is, to think about the future is a zero sum game, because nothing every works out well in Bad City (this is a noir movie after all). All we have is the present, and maybe the past to learn from. Except that what we learn from our pasts might not be anything but that we’re born ‘bad’ and need to come to terms with that. Or not. The movie is filled with ambiguity. Which I love. I know many people don’t. They want the vampires to be defeated. They want love to transform us. Director (and writer) Ana Lily Amirpour isn’t going to give us either of those. Music dominates this movie, the soundtrack not background music, but a Tarantino-esque use of pop/rock songs, some of them Iranian, some western. This movie has been described by some as, in part, a Sergio Leone western like The Good The Bad and The Ugly, but that’s not true, and only comes from one single song played early on, featuring a mexican-sounding trumpet, as Arash drives his very American 50s American Graffiti car through the desert. It’s a great scene and kind of the most energetic one in the whole movie, but it’s only one song among many, which run the gamut from techno to at least a mention of “Hello, Hello” by Lionel Richie. It’s through music that ‘The Girl’ seems to be learning how to be human. The first time we see her is in her basement apartment, taking some tentative dance steps. But what does learning to be human consist of? Learning, I think, how to go beyond black and white thinking (the movie is in black and white, of course), how to go beyond ‘good’ and ‘bad’ (evil is never mentioned in the movie, though at least in the translation subtitles, the word ‘bad’ gets a double meaning as both ‘evil’ and sexually bad, as in she’s a ‘bad girl’ because she takes control of her sexuality. Maybe. But she observes humans throughout the movie. Almost every scene shows actor Sheila Vand‘s face, highlighted by her black hijab, staring in almost wonder and certainly fascination at the humans she encounters, and one scene in particular, when she meets Arash at a huge power station outside of the city, the whole scene she just stares at the mechanical monstrosity, as if thinking, how can the humans create such a thing? Who are these humans that are so fragile, but who can build something with that much ‘power’? Or, perhaps, who are the real monsters? Amirpour knows her stuff, knows her western cinema. Yes, she has nods to George Lucas and Quentin Tarantino, among probably others I’m leaving out, but only towards the end of the movie did I figure out that her style reminds me of David Lynch. I don’t know what took me so long, because it then was so obvious. It’s the black and white, and the stilted minimalist dialogue, but most of all it’s the pacing. Because I’ll tell you up front: this movie moves slow. Which is a good thing, and in fact, the slowness adds to the shock when the film is speeded up during the vampire’s actual attacks: a great use of a standard basic old-school effect. The rest of the creep factor is all about mood. This is noir, things start bad, and get worse, there’s no happy ending, but you know that from about the first scene. Just don’t expect something like 28 Days Later. Nor even Twilight. A Girl Walks Home Alone at Night has more humanity, by questioning what being human means, than Twilight could ever hope to have. Without giving any easy answers.